We check out the buzz behind Toronto's sweetest hobby. Photo courtesy of Shawn Caza. Urban beekeeping has all the hallmarks of a millennial trend: it’s hands-on, environmentally friendly, vaguely old-timey, and requires a distinctive outfit. But unlike taxidermy, bookbinding, or terrarium assembly, urban beekeeping’s popularity shows no signs of slowing down. Membership in the city’s half-dozen active beekeeping organizations continues to rise, and hives have now been spotted everywhere from the University of Toronto’s Faculty Club to the roof of the Fairmont Royal York. The crowd may be diverse, but their common bond is strong. Berney’s partner Shawn Caza is also a fellow beekeeper—in fact, the two met at a Co-op meeting. Together they run Toronto Honeys, a bicycle-powered business that sells the honey derived from their hives on the Fort York historic site and the roof of the Amsterdam Brewery. It’s a community with deep local roots. 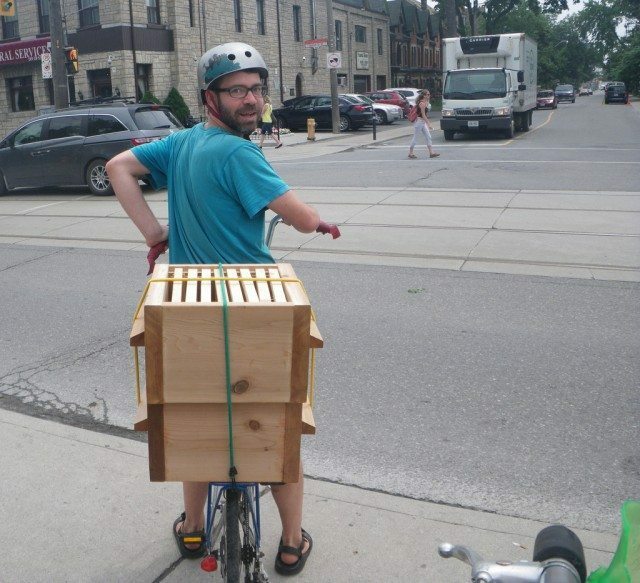 Urban beekeeping’s rise in popularity has been well-documented over the past decade, but Toronto has long been a hive for aspiring apiarists. As Fran Freeman, an urban beekeeper whose hives include those at Humber College and the Humber Aboretum explains, urban beekeeping has been going on in Toronto since it was, well, urban. It’s a mutually beneficial relationship. In an email to Torontoist, Freeman notes that bees are a keystone species in the ecosystem, as their pollination supports a wide variety of plants and wildlife. She adds that more bees leads to an increase in pollination, resulting in a more beautiful landscape and a larger bounty of fruits, vegetables, nuts, and seeds. 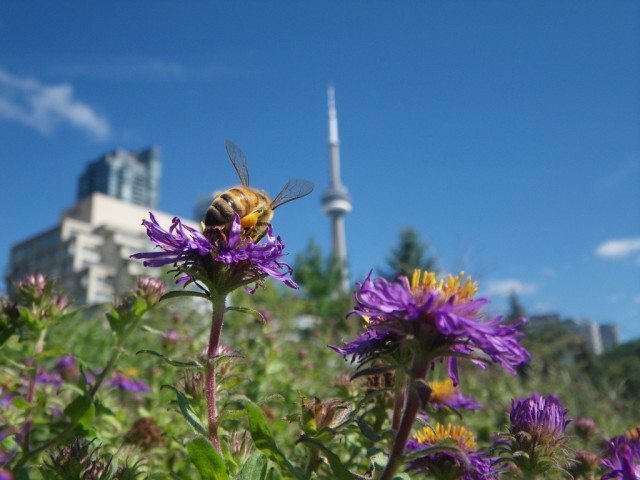 Despite the many benefits and its dedicated supporters, Toronto has long had a reputation for being inhospitable to beekeeping. It’s all thanks to a provincial law that requires bee hives be 30 meters from any residential area or place of assembly, and 10 meters away from highways. Pretty restrictive for the average family in a duplex. So wannabe beekeepers without the requisite yard space have two choices: hide your hive until your neighbour lodges a complaint, or become an urban beekeeping ambassador who explains the benefits of the practice. And if that fails, fresh honey can work as a pretty powerful bribe. It’s arguably a better arrangement than the much-hyped bee oasis of Vancouver, where beekeepers face a long list of training requirements, a limitation on the number of hives they can keep, and tough obligations surrounding proactive swarm control. 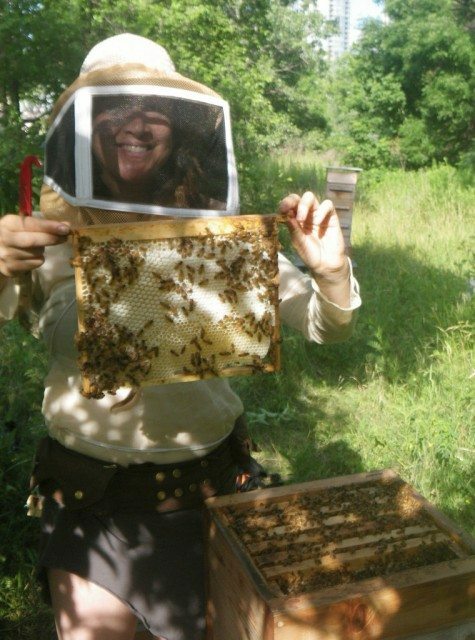 Melissa Berney shows off her hive. Photo by Shawn Caza. Although Berney and Freeman both welcome the influx of new beekeepers among their ranks, they worry about the spread of misinformation that accompanies any booming trend. And in a buzzing community like Toronto’s, there’s really every opportunity to do so. 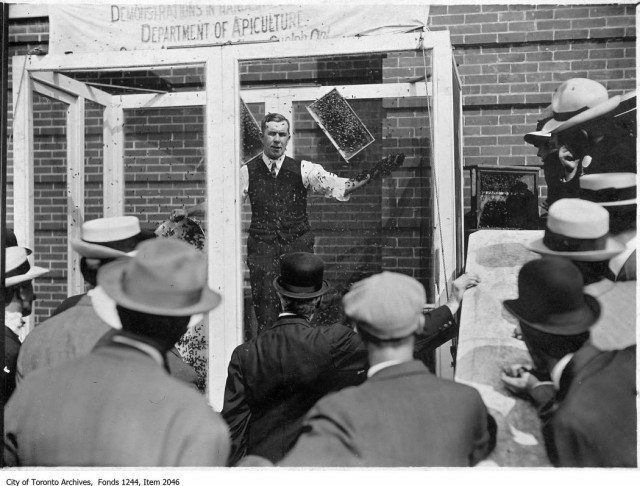 CORRECTION: 5:03 PM The article misattributed a quotation about the founding of the Toronto District Beekeepers Association in 1911 to Fran Freeman. The sentence was written by the author of the article, and the quotation mark was misplaced in error. It should have started with the sentence “Several beekeepers kept around fifty hives each along the Don River in the beginning of the 20th century…” We regret the error, and to avoid confusion have deleted the misattributed sentence.